I just returned from a long, but fabulous, week visiting 7 schools in DeKalb County, IN. After visiting McKinney-Harrison last Thursday, things got really busy and I didn’t get a chance to write about all the rest of the awesome schools I visited. In order, they were: Waterloo, JE Ober, Riverdale, Country Meadows, Butler, and JR Watson. 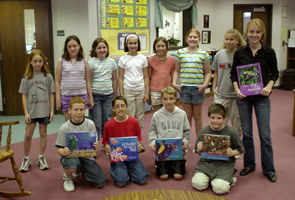 I was totally impessed by all the artwork and books made by the students at these schools. Good job, kids! Thanks so much to all the parents and teachers who made this week work so smoothly. Hello from McKenney-Harrison School! Fourth grade teacher Mr. Kindler worked with his visiting author committee to bring me to the Auburn, IN area where I will visit 7 elementary schools over the next week and a half. Today I begin my tour with a visit to Mr. Kindler’s school. I gave 2 main presentations, one for the younger students and one for the older ones. Then I met with 2 smaller groups of kids over lunch. These were students that were particularly interested in writing or illustrating, and they were fired up with tons of questions. During the smaller group meetings, I had a chance to show the students some pages from my journals. I was very impressed that every grade had writing projects displayed in the library! Good job, McKenney-Harrison!